This is part one of a three-part blog series, Soil Carbon Curious, powered by our partners at Elemental Excelerator. Better grazing management also makes farmers more profitable. Healthy soil improves water holding capacity, which helps your land make the most of rainfall. Healthy soil life increases the land’s natural productivity, reducing input costs and improving profitability. Soil health is about a lot more than simply carbon. Dr. Elaine Ingham describes the soil ecosystem as a healthy soil food web. The healthiest soil is alive—it supports a lot of life and cycles nutrients quickly to make nutrients available for other life. Soil that has a lot of life below ground supports a lot of life above ground. Healthy soil is a great sink of carbon, and it stores more carbon than it cycles. Cotton Underwear Test. Bury cotton briefs for 5-8 weeks, and dig up to see how much mass has been decomposed by living soil organisms. Point Blue Conservation Science has taken soil samples from 85 ranches around Northern California since 2015. 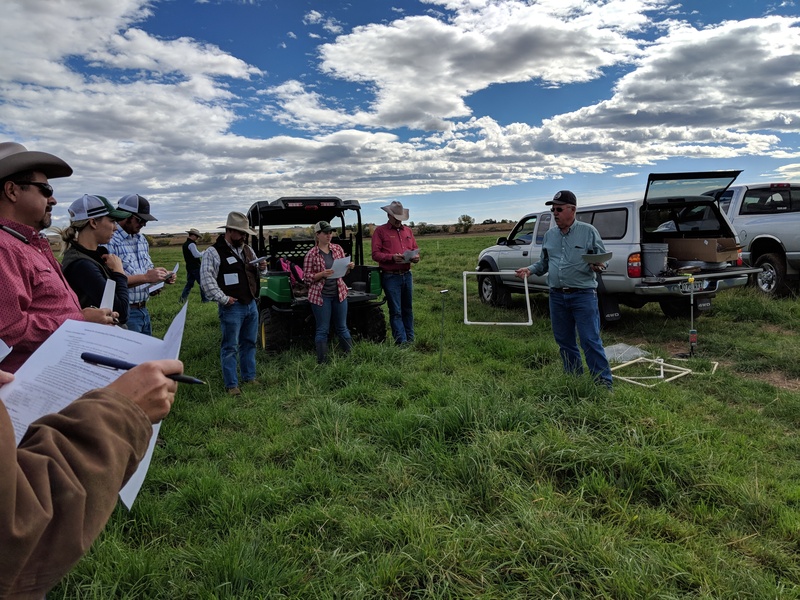 They have also built an open-source handbook, collection forms, and data protocols allowing any research team to take consistent soil health tests measuring water infiltration, bulk density, and 54 other indicators. The Haney Test includes multiple tests. Solvita- CO2 Burst. This methodology takes dried soils and performs a “re-wetting” process to measure CO2 respiration to measure microbial activity in the soil. The test also uses water to measure how much organic carbon and organic nitrogen can be extracted (usable by plants), a carbon:nitrogen ratio. All of this indicates how much nutrient can be easily broken down by microbes to be used by plants. Based on these factors, an overall soil health calculation from 0 to 50 is given. Stefan Gailans is the research and field crops director at Practical Farmers of Iowa and has been working with crop farmers to amass soil health data over several years. PFI has been encouraging farmers to conduct both the “tea bag” test and send in soil samples for the Solvita- CO2 Burst analysis. QuickCarbon. A handheld soil reflectometer technology developed by Yale School of Forestry – Ucross High Plains research team. It uses spectral imaging from a pocket handheld device, a phone app, and a power drill to quickly sample a large number of soil samples. The Yale team then builds a model using the collected data set and a few of the actual soil samples sent to a lab to calibrate the samples. The end result is a visual “tapestry” of the soil carbon stocks on your land. Quorum sensing is one of the of the most exciting frontiers of soil microbial research. This TED talk explains how bacteria talk to each other and can switch on (quorum) or off (quenching) biological activities based on signals sent to each other. The leading practitioner of quorum sensing and quenching on soil health we know is Nicole Masters of Integrity Soils. We are not currently aware of any quorum sensing soil testing labs that offer commercial services. Please let us know if there is one! LandStream – this is a combination of underground flow sensors that can detect watershed health and create a 3 dimensional map of water and soil health down to 4 meters. Abe Collins is the founder of LandStream and is currently piloting it at Gabe Brown’s ranch. Know any tests that should be on on this list? Contact us or comment below. Stay tuned for Soil Carbon Curious Part II: Sharing Soil Carbon Data and Knowledge.